Guests must present a valid credit card upon check-in to cover incidental charges and the security deposit. The Front Desk will run authorization on your card so your bank or credit card company may reflect this by temporarily reducing your available balance or credit limit. It is not a charge. The authorization ensures that the card is valid and will be released 5 to 10 days after check-out, provided there is no damage, missing inventory, room charges, or excessive cleaning required. Amount authorized at this property: approximately 150.00 USD per night when staying in a guest room. Amount may be higher when staying in a suite. On the edge of the Rockies in beautiful Denver, the Ritz-Carlton Denver’s rooms and suites exude luxury and the warm, modern touches immediately evident when walking through the lobby doors. 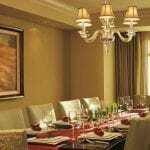 No detail has been overlooked at the Ritz-Carlton — from first-rate steakhouse Elway’s to the fitness and spa facilities, body, mind and soul will be in perfect harmony throughout your Denver stay.